As Google announced their upcoming cloud gaming platform, they also introduced their newest piece of hardware. 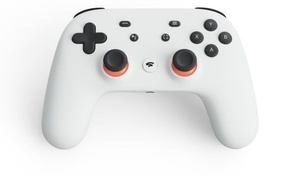 While Stadia doesn't require any hardware boxes to operate, Google did reveal the Stadia controller. The Stadia controller looks like a typical console game controller, perhaps a combination of both Xbox controller and the Sony's DualShock. The controller connects straight to the Stadia server using WiFi and it recognizes which device or screen you are going to play the game on. The controller has two dual triggers for index fingers, a D-pad, two analog sticks, and four ABXY buttons like the Xbox controller. It also features both a dedicated capture button for YouTube streaming as well as Google assistant. Pressing the latter will open up Google Assistant which you can use by voice with the built-in microphone. Google Assistant is said to have special in-game features that are put in place by the game developers. The controller comes in three different colors, and just like the service itself will be available later this year. <Google's game streaming platform is called Stadia >Has Google managed to beat latency problems with Stadia?